Peria Chronicles developer showing the game at G-Star 2016? South Korean game expo G-Star 2016 is right around the corner and while it seems that NCSoft won't be attending due to the organization not allowing them to host a Blade & Soul tournament, Nexon is actually going to be a very strong presence. The studio will have several booths with its teams showing their games, including Neople, NDoors and ThingSoft. This last one is, of course, the Peria Chronicles developer and this is hinting at a comeback of this anime sandbox game. With the massive challenge apparently behind, Peria Chronicles is now back in full development and hopefully we'll see the first trailer in ages, or at least some new screenshots. 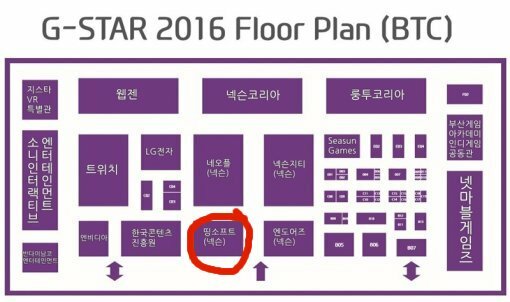 The G-Star 2016 expo runs on November 17-20 in Busan, Korea, and you can see the floor plan below, with booths for Bandai, Netmarble, SCE, Webzen and more. We highlighted ThingSoft's booth just in case.